So yesterday as I was scanning the #NJED hash tag on TweetDeck I came across this intriguing image shared by Mike Marotta. It really puts into perspective why we make many of the decisions that we do at New Milford High School as to why we decided to implement a Bring Your Own Device (BYOD) initiative and don't mandate the use of one specific tool to support learning. His tweet contained this message, "Don't let the device drive instruction. Let it support learning." When it comes to educational technology I often get the feeling that the learning is often secondary. Using technology just for the sake of using it equates to a huge waste of instructional time that could be dedicated to deep, meaningful learning. It also equates into a huge wast of money. All to often I have seen schools put interactive whiteboards (IWB's) in every classroom or go 1:1 with very little focus on learning. The key is to determine what we want our students to know and let them have a choice as to how they will demonstrate and/or apply their learning. At NMHS we place a great deal of emphasis on creating artifacts to demonstrate conceptual mastery. Technology can become a nice pedagogical fit when viewed this way. Our motto is pedagogy first, technology second if appropriate when integrating mobile learning devices. Another image created by my friend Bill Ferriter puts into perspective the importance of establishing learning outcomes when integrating technology as part of the teaching and learning process. When it comes to technology we must always ask ourselves how will this tool support learning and allow students to demonstrate conceptual mastery. There must be more of a concerted focus on learning outcomes, construction of new knowledge leading to authentic application, and the development/enhancement of essential skills (creativity, critical thinking, problem solving, digital citizenship, entrepreneurship, media literacy, technological proficiency, communication, collaboration). The assessment and feedback pieces are also critical. Now let me attempt to tie this back to the first image contained in this post. 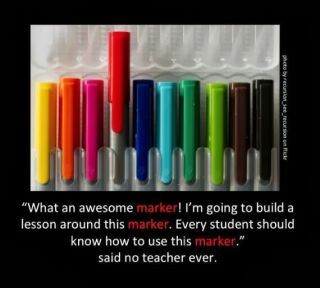 Technology can be a powerful learning tool if we don't focus on the one marker, but instead what we want our students to be able to do with their choice of makers to support and demonstrate learning. I welcome your thoughts on this.